Depressed, turning down invites to social occasions and generally feeling ill, Jan knew she had to do something about her weight. 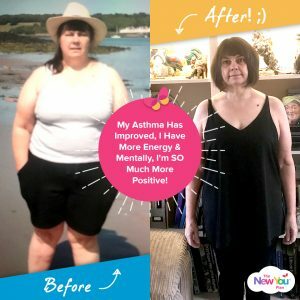 Following watching a TV programme about VLCD, realising they work and are backed by the NHS, Jan discovered The New You Plan and feels like an entirely different person. 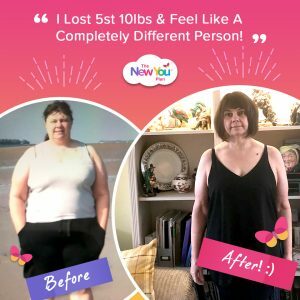 Here, she shares how she lost 5st 10lbs and hasn’t looked back! Jan, describe how you felt before you started the plan? FAT(!!! ), ugly, old, depressed, unfit, debilitated, extremely unhappy and I had a really negative view of the future. It was hard. l just didn’t feel like ‘me’ anymore. How did you discover The New You Plan VLCD? 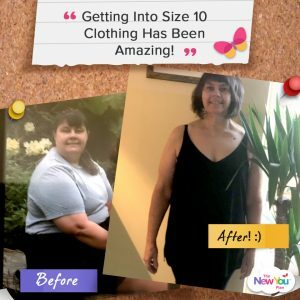 I started my New You journey on June 5th 2018, after watching the special BBC programme about VLCD and the controlled experiment that they did with a group of overweight and mostly unhealthy, diabetic people. Some NHS doctors were observing this experiment and seemed quite skeptical about the safety and effectiveness at first, but soon changed the traditional opinions that they (and I) had had, after seeing the remarkable results. 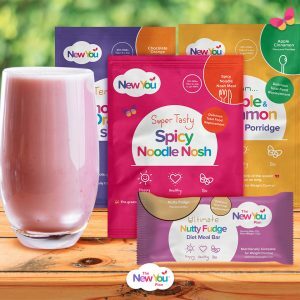 Following watching the TV programme, I went online to research VLCD companies and liked the look of New You, compared to similar plans so I took the plunge and placed my first order. I’m a different person now. This plan has helped me to return to the more positive person I used to be years ago, instead of being low all the time, with no interest in any social events or the future, in general. In regards to my health, it has also seen a massive improvement. I’m far less breathless, which has improved my asthma quite a bit. I have tons more energy. Mentally, I’m SO much more positive in general. I really wanted to avoid sinking into sustained depression again and with each pound lost, I felt this slip away. Plus, I also wanted to be able to have more choice when it came to choosing clothes. I loved having a newfound energy and inclination to tackle projects, chores and start accepting more social invitations so it definitely spurred me on to stay on track each week. I just didn’t want to go back to how I was feeling before. Fastening size 10s, for goodness sake!!! I only ever dreamed of this before. I was extremely proud of myself for getting straight back on plan 💯 after a week of Christmas festivities. It would be easy to led old habits creep back in but I was so determined not to undo my efforts. People saying they’re impressed with my focus and commitment has been lovely! I tend to favour savoury tastes, so the Spicy Noodle Nosh is top of my list. I also LOVE the Shakes – I actually can’t believe they’re part of a diet?! Apple Cinnamon Porridge is very comforting, especially during these winter months. Finally, the Peanut Crunch Bar is fab with a coffee, while watching TV at night. Do it! It’s a no brainer! Because everything is all properly worked and most of the meals are simply made by adding water, it’s an absolute breeze. Plus, with all the vitamin and minerals you need each day added, it gives us everything essential we need to be healthy AND exactly the right amount to trigger the best shrinkage. 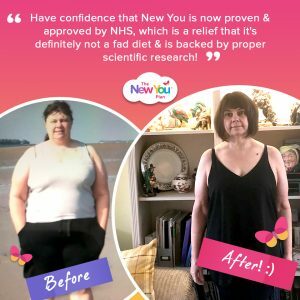 Please have confidence that The New You Plan is now proven and approved by the NHS, which is a relief that it’s definitely not a fad diet and is backed by proper scientific research. Everything tastes great with was a total surprise. Make loads of friends and share concerns and encouragement with the fabulous Secret Slimmers support group. ← Is Dieting Too Hard For You?